I recently read Ruby Heart by Cristelle Comby to review it as part of the author’s current blog tour. 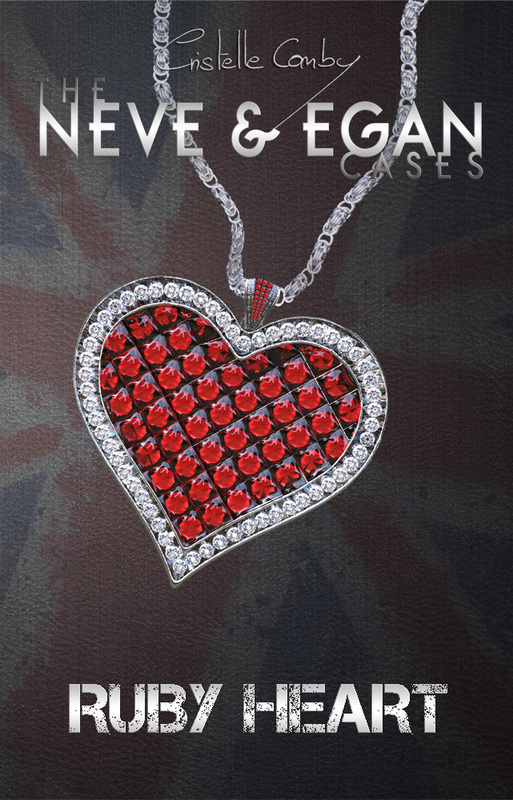 This is how the author describes the book: “When elderly client Doris Hargrave informs private investigator Alexandra Neve that her beloved antique ruby heart necklace has gone missing for the second time in a period of over sixty years, Alexandra knows this is no ordinary jewellery theft. The ruby heart is a family heirloom and the only thing that connects an ailing Mrs Hargrave to her parents, who were murdered during the Holocaust. To solve the case, Alexandra and her business partner, blind history professor Ashford Egan, must sift through obscure Holocaust documents to find out the truth. It’s in this way that they learn of a secret World War II era love affair which could hold the key to all the answers they are looking for. Meanwhile, Egan is under immense pressure from the university to quit his private investigating business, and Alexandra is afraid that a man she trusts will leave her. Again. It seems that humour is an integral part of modern cosy mysteries. I didn’t really expect it when I began reading the book but I very much enjoyed it. Alexandra (Lexa) narrates the story and her tone is often flippant and full of deadpan humour. This is one of the things that most appealed to me about the novel – and made Lexa an appealing character. Lexa and Ash are two rather bumbling private investigators and that adds to the book’s appeal. I liked the pair and wanted them to solve – and survive – their latest case. They aren’t completely inept but they still have a lot to learn about detective work. I admired the way the author handled Ash’s blindness. A handicapped protagonist who has moments of heroism in a crime story is unusual but Ash is portrayed with realism, including his limitations as well as his strengths. Lexa and Ash are very different from each other and there is a significant age difference between them but they are a good team and good friends. There’s also an unacknowledged attraction between the pair that adds to the story’s tension. The novel ably weaves together elements of the past in Nazi Germany with a mystery in present day London. Using the clues the author drops into the story, I thought I knew who stole the necklace and why. I was on the right track but I had to read to the end to tie up all the ends. Having an idea ‘whodunnit’ before the last page didn’t make me lose interest – I was engrossed in the private investigators’ lives and had to find out how they worked it out. Ruby Heart is aimed at the new adult reader and, as the story unfolds, the author gets inside Lexa’s head to reveal the issues and insecurities that concern her as a young adult. While I am past that stage of my life this didn’t deter me from reading the story. Lexa is a well drawn character and I could empathise with her despite our differences. The novel has a pair of likeable main characters and an intriguing mystery to solve. Despite being a mystery, it is a funny and a feel good story. I think it has a broader appeal than just the new adult market: it will appeal to any readers who enjoy cosy mysteries. To learn more about Cristelle Comby and Ruby Heart visit her webpage and the book’s Goodreads page and Amazon page. About Cristelle Comby: She was born and raised in the French-speaking area of Switzerland, in Greater Geneva, where she still resides. Thanks to her insatiable thirst for American and British action films and television dramas, her English is fluent. She attributes to her origins her ever-peaceful nature and her undying love for chocolate. She has a passion for art, which also includes an interest in drawing and acting. Ruby Heart is her second new-adult novel, and she’s hard at work on the next titles in the Neve & Egan series. This entry was posted in December 2013 and tagged British cosy mystery, cosy mystery, Cristell Comby, Neve & Egan, Ruby Heart. Bookmark the permalink.